Just wanted to quickly share our menu for the weekend. I will post pictures of everything throughout December so be on the lookout for those posts. Once I make a menu like this I will email it to myself and to Patrick so that we are both aware of our upcoming meals. It's also helpful because, since we always have smartphones handy, if I'm in the kitchen starting to cook something but have forgotten what to do next, I can ask Patrick to access the recipe from the email link! Most of the menu items are hyperlinked. Patrick and I are looking forward to celebrating our first Thanksgiving together! We are planning to have a quiet Thanksgiving together and then my parents will arrive Friday afternoon in anticipation of the Blues Rivalry football game Saturday. That's right, folks, Patrick and I are going to the Duke @ UNC football game together! Traditionally these two teams play Thanksgiving weekend and we look forward to making this an annual Eibl Family tradition. Since my parents are coming Friday we decided to have a smaller meal Thursday (but still having turkey) and then have a larger, more elaborate meal on Friday complete with appetizers and dessert! 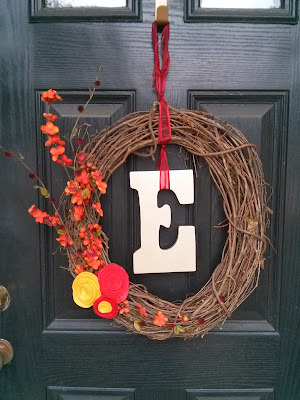 I am thankful for the "E" on my front door this Thanksgiving. What a wonderful celebration we had in August joining our families. I look forward to having Patrick by my side as we continue to celebrate life and cherish special moments together. Happy Thanksgiving to you and your family wherever you may be! After one mother visits, the other mother must visit too (and then friends must visit; be on the lookout for a Homecoming Brunch post). This visit was a little different than usual. My mom and Granny were spending the weekend in Sanford. 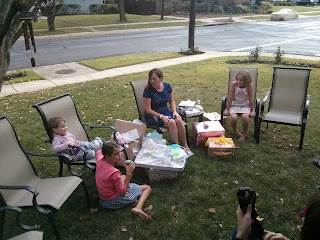 One of my mom's friends, Glenda, recently welcomed a new grandbaby to the family so it was a "Meet the Baby" trip. Glenda hosted a girls brunch Saturday morning which I was invited to then we were able to meet the grandbaby. He was enjoying an afternoon nap when we visited so I look forward to spending more time with him. Since the Saturday brunch was girls only Patrick stayed here in Durham. This means that my mom and Granny wanted to visit on their way home so they could see their new grandson- / son-in-law. 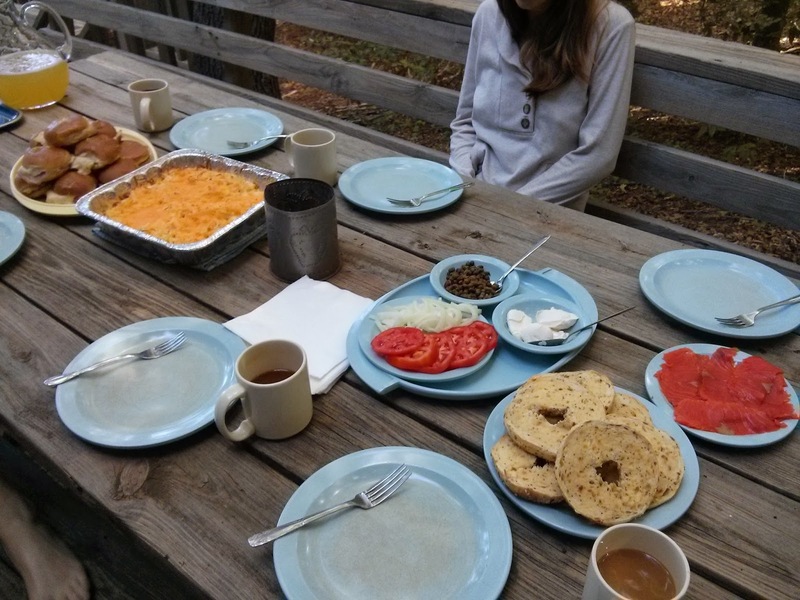 We knew that Glenda would have good brunch leftovers for them in Sanford before they left but thought they could use a savory brunch appetizer by the time they would arrive in Durham. 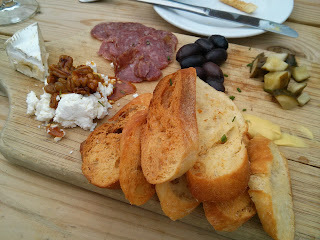 I was inspired by this Salami & Cheese Board appetizer from Geer Street Garden in downtown Durham. And I knew we could make some yummy baked brie (from our first experiment at our Casual Get Together in September). I knew this would be a good savory brunch option because my mom was with us when we went to Geer Street Garden! This was actually back in June; she came up for a final walk through with the venue and to finalize some wedding decisions. Patrick originally selected this appetizer because of the goat cheese but I knew my mom wouldn't say no to olives! We served toasted whole wheat bread on a platter with grapes and salami. The platter is part of our Denby Halo collection. Since this was more brunch and less dinner appetizer we subbed out the olives and pickles for the fruit. For the brie we sliced it in half horizontally then smeared a grilled vegetable tapenade on top of the bottom half of the brie cheese wheel. Then we placed the top half back on and baked it in a 350F oven until melted and bubbly (about 20-25 minutes). Even though my mom really loves olives, Patrick really does not so I thought the grilled vegetable tapenade (versus an olive tapenade) would please them both. By slicing the brie in half the cheese wasn't restricted by the wheel rind and could melt throughout the baked brie vessel. It was really tasty! Do you have a favorite baked brie dish? At our casual get together pot luck we made it a bit sweeter: with pecans and honey! The possibilities are endless with brie! Patrick loves to make pickles. He misses them so much over the winter that as soon as cucumbers appear on the spring CSA list he requests the cucumbers so he can make pickles and satisfy his craving. I decided Patrick shouldn't have all the pickling fun! So off I went on an adventure to pickle beets. The recipe called for a rosé wine which isn't a wine we usually keep on hand. I usually do all our wine shopping at Trader Joe's but at this particular time I was eating lunch with Patrick and there is a Total Wine store conveniently located near his work so I stopped in. I wasn't in too much of a hurry but I knew I just wanted the rosé (versus browsing). While I began my search for rosé a sales associate asked if I needed help and, even though I usually turn down assistance, since I knew I just wanted that one thing and they could point me in that direction quickly I accepted their help. They walked me to the rosé and continued to help! They wanted to know what I would be doing with it and I said trying a new recipe. I think the associate was a bit taken aback when he learned I wanted a rosé wine for pickling beets... he didn't ask anymore questions. Anyway I bought the one he recommended and it was good! I've always heard when cooking with wine you should purchase one you would enjoy drinking and I couldn't agree more with that sentiment! 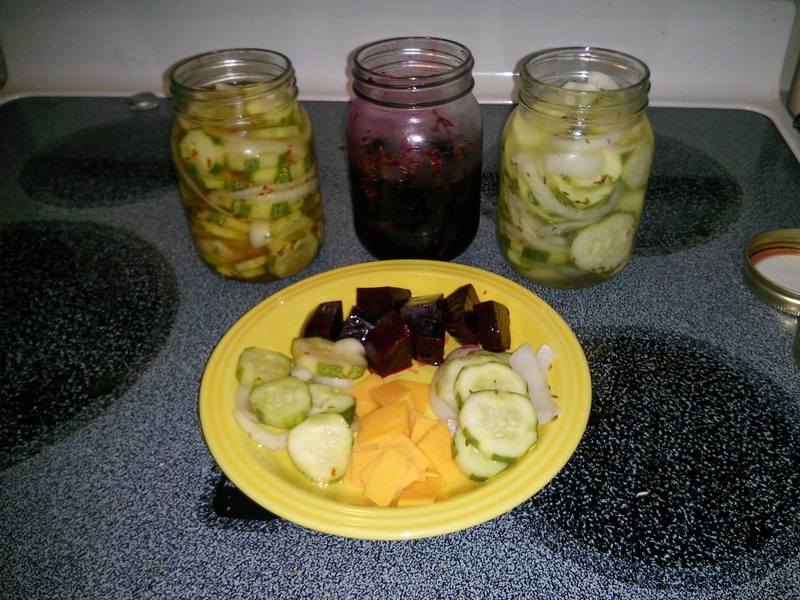 Enough about wine... moving on to pickled beets! 2. Leave root and 1 inch stem on beets; scrub with a brush. Place beets in an 8-inch square glass or ceramic baking dish; add water to a depth of 2 inches. Cover with foil; bake at 425° for 50 minutes or until just tender. Drain and cool. Peel beets; cut into 1-inch wedges. Place beets in a large heatproof glass jar or bowl with peppercorns and thyme. 3. Combine raspberries and remaining ingredients in a medium saucepan. Bring to a simmer; cook 4 minutes, stirring occasionally, until sugar dissolves and raspberries begin to break down. Strain raspberry mixture through a fine sieve over a bowl; discard solids. Pour hot raspberry liquid over beet mixture; cover and chill at least 8 hours or overnight. Patrick kindly makes two batches of pickles; one spicier for himself (on the left, you can visibly see more red pepper flakes) and one for his wife with minimal red pepper flake (on the right). Editor's note: throwback post; we made these during the engagement. Even though this is a throwback post, beets are a cooler weather vegetable and come back in season during the fall so these would be a good Thanksgiving side! This next installment of registry product information is cookware! Much like our casual dishes our cookware was purchased when Patrick moved into his bachelor pad. We had the Cuisinart Chefs Classic 10pc set (as seen below). I recommend this as a good mid-range set. 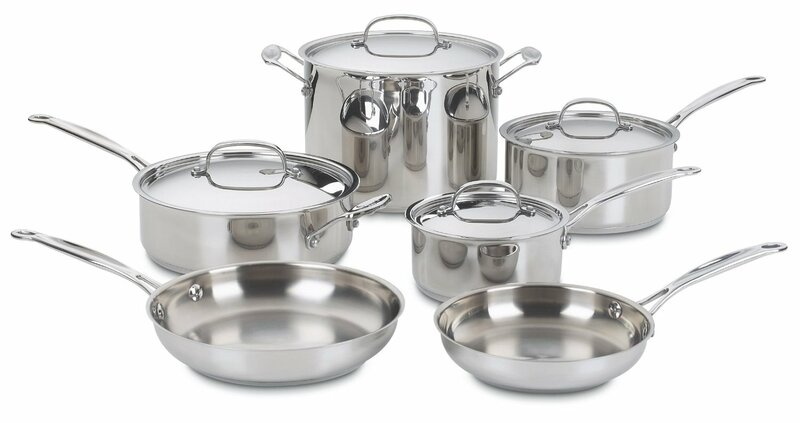 And the reason I refer to it at "mid-range" is because there are other stainless steel sets that conduct heat better. Stainless steel alone does not conduct heat very well. Aluminum, on the other hand, is a great heat conductor. In mid-range stainless steel cookware sets (like the Cuisinart Chefs Classic) there is only an aluminum encapsulated bottom. This means that only the bottom of the pot/pan is conducting heat and not the sides. For even heat conduction a pot that is fully clad with aluminum is your best bet. In the above picture you can see a tiny line at the bottom of the pan and this is where the aluminum is. In a fully clad pot the bottom and sides will be seamless. As for stainless versus nonstick I think that is personal preference and should be chosen according to your cooking style. Stainless is, however, easier to care for. It can go in the dishwasher and you can also use any utensil with it whereas nonstick pieces should not go in the dishwasher and you should only use wood/silicone utensils with pots. One last thing we considered before we registered was what pieces to register for. Should we do a large set or open stock? We opted for open stock. Just like our casual dishes we wanted to be able to customize our cookware set and we only wanted pieces that we would use. This also allowed us to mix and match stainless and nonstick. I think the type of pot/pan definitely is a factor with what kind of pot finish you have. Ultimately we chose the Calphalon Contemporary line. 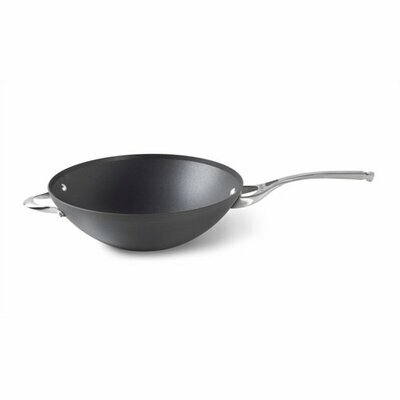 It has fully clad stainless and hard anodized nonstick lines. Below is the stainless set. As you can see there this 10 piece set can be very limiting. We usually prefer nonstick skillets to stainless and also wanted the larger multi-pot versus the stockpot. We did choose two pots similar to what was in the set. Read on to see what items we registered for that varied from the 10 piece set. If you could choose between a stock pot or a multi-pot I think it's a no-brainer to choose the multi-pot! 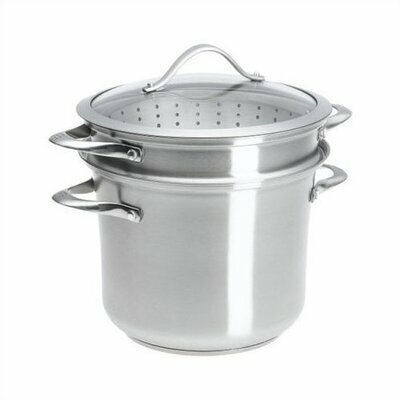 It's a stock pot, steamer, and built in strainer in one! We have loved having this multi-pot in our arsenal of cookware. One evening I was making a pasta dish that had broccoli in it. And guess what I did?! Cooked pasta in the stock pot with the strainer and then steamed broccoli above it in the basket. Then once the pasta is done I can simply remove it by taking out the strainer. This is also helpful if a dish requires putting some pasta water back into it. Patrick has heard me mutter "oops, I was supposed to reserve pasta water" more times than he would care to admit I bet! This pot is also great for making homemade chicken stock! We put the carcass of a roasted chicken with an assortment of veggies in the strainer and fill the pot with water. After a few hours of simmering we can lift the chicken and veggies out and have amazing stock left behind. As previously mentioned, registering for or buying cookware open stock allows you to create an ideal set for you. You can mix and match various sizes and finishes to the demands of your kitchen. 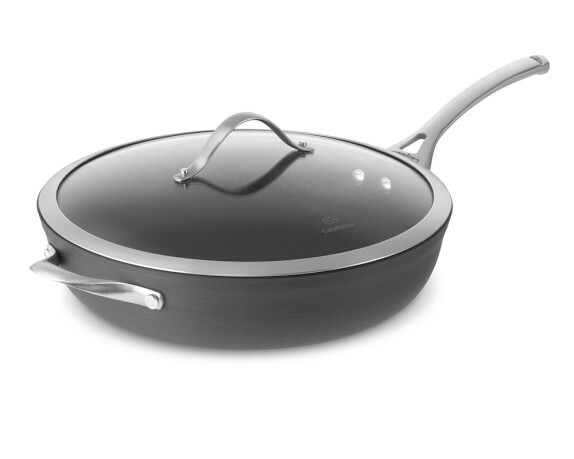 In the stainless steel set there is a 3 quart covered saute pan. We actually wouldn't mind this pan but know we would use a large nonstick skillet for more cooking. 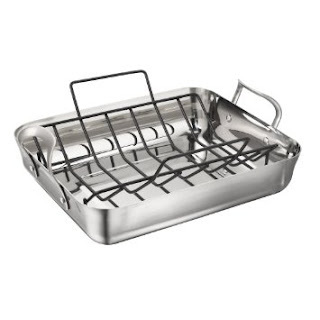 In the future we may add the stainless saute pan to our collection so that we can sear items and then make sauces with the browned bits left behind (the browned bits don't develop as much with the nonstick surface). Patrick and I were very conscious with selecting just the right cookware pieces we wanted so we wouldn't have extra cookware clutter. When we registered we looked at our current pieces and asked ourselves "what don't we use that much?" Since we've enjoyed cooking for the past few years now we are familiar with our skills and abilities to know what pieces would be advantageous to have and pieces we wouldn't need. At some point we know we'll be hosting a holiday dinner and will need a roaster so we registered for one. But we've already been using it! We like roasting a whole chicken and having the meat repurposed for leftover meals later in the week. And of course we then utilize the multi-pot to make chicken stock with the chicken we roasted with this roaster! Patrick loves to stir fry! His absolute favorite recipe to follow can be seen here. We make this quite a bit. Even though stir fry dishes can be made in a large frying pan we wanted to have this specialized piece since we do enjoy stir frying. Do you have a specialized piece in your kitchen to make a favorite dish?! We'd love to hear about it. One weekday I found myself with an acorn squash and some kale (leftover from baked kale chips) dwindling from our weekly CSA box. Per usual I googled around a bit and found a perfect fall salad. The vinaigrette really complemented all the flavors. We topped the salad with baked salmon for some protein. Preheat oven to 350F. Toss acorn squash with 1 tablespoon oil, garlic cloves, and thyme. Season with salt and pepper. Place contents of bowl on baking sheet and put in center rack of oven. Cook until squash is tender and edges begin to caramelize, approx 15 minutes. Remove from oven and set aside. To make vinaigrette: place vinegar in small mixing bowl; while whisking, slowly pour in remaining 1 tablespoon of oil to emulsify. Add shallots and season to taste. To assemble: In large mixing bowl, toss arugula with vinaigrette and pomegranate seeds. Place arugula on four serving plates, divide the squash among the plates and tuck them in between the leaves. Garnish with the toasted pine nuts. Since the acorn squash were being baked in the large oven, we placed the salmon on the same baking sheet half way through cooking the acorn squash (we found they needed a little longer than 15 minutes). The salad provided lots of flavor and texture with the squash, pomegranate seeds, and vinaigrette so we opted for a simple preparation of the salmon. We rubbed it with a little olive oil, salt, and pepper. We have successfully utilized a quiche recipe for most of this year! I imagine we must have first tried it along the times of when the blog ceased. 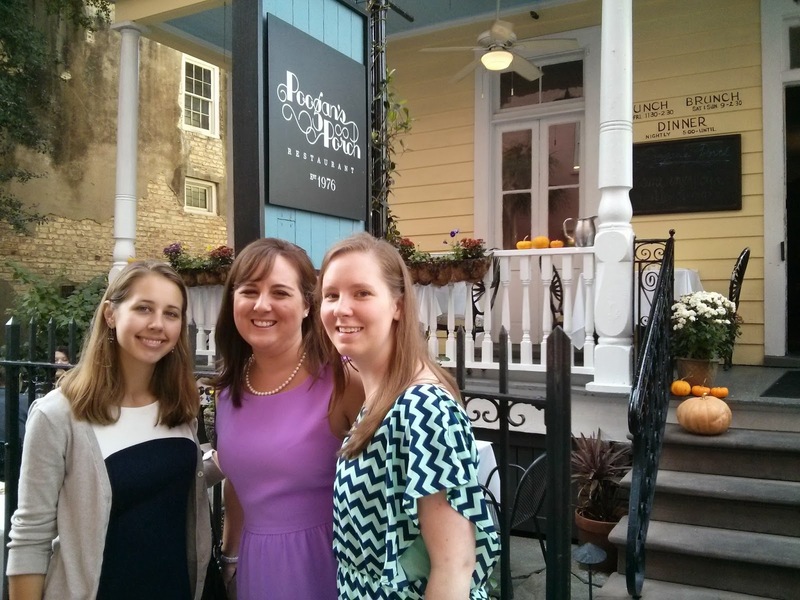 We recently had DC folks pit stop at our house on the way to Charleston for Christine's wedding (happy one month and a day now!). They came in on a Thursday night and then Holly and I had to be prepared to leave Friday morning before 8am to get to Charleston for a bridesmaid luncheon. This means no time to stop for food! Thursday afternoon I made a quiche and the next morning Holly commented that she enjoyed it. So this is for Holly to make quiche! The recipe comes from the Murfreesboro Baptist Church Cookbook "Feeding the Flock" and was the recipe of a well respected lady in the neighborhood. She was also a fantastic crocheter / knitter. This is the second recipe out of the book that's become one of our go-to meals: the other is Chicken Allouette. Prepare pie crust. Combine remaining ingredients and pour into crust. Bake at 375F for 45 minutes or until firm and brown. Cookbook note: Sprinkle crumbled bacon or crushed French fried onion rings or chopped ham in bottom of pie crust for variety. --Use a deep dish pie shell! --Instead of mixing everything together we place whatever variation we're making on the bottom of the pie crust and then sprinkle a few handfuls of cheese on top then pour the milk and egg mixture over everything. Back at the end of October we had our first visitor of a three-weekend hosting visitors spree. Patrick's mom visited then, my mom and Granny visited next, and finally my college friends came for UNC's Homecoming! What a whirlwind of fun activities. Here's a brief recap of the first visitor: Marie! 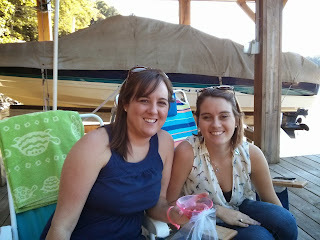 She arrived late Friday evening and departed early Monday morning which means two full days of doing local NC things. As with any weekend anywhere most special events with any organization happen on Saturday. 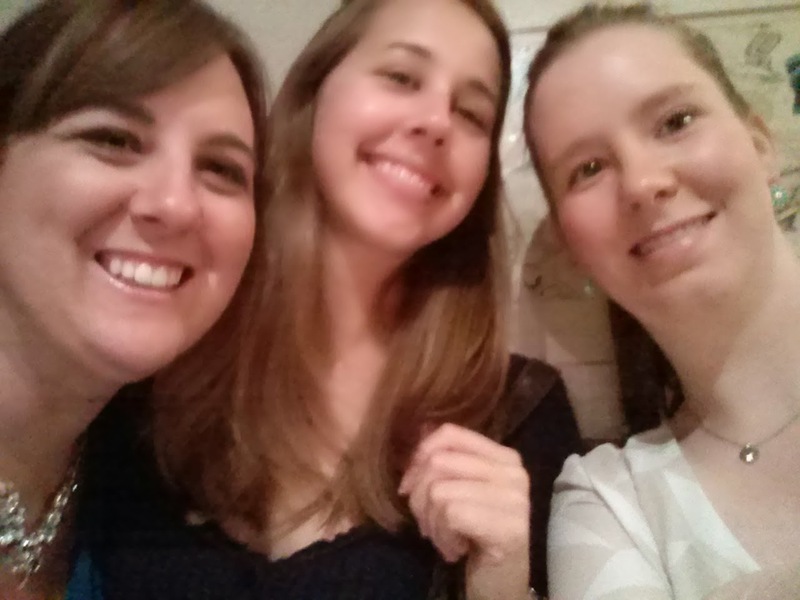 We had a lot of options to choose from but ultimately chose to spend the day in Saxapahaw. Saxapahaw is about a 40 minute drive west of Durham. It's only a small incorporated area but boasts a winery, renovated mill with amphitheater and a music venue, and nice dining establishments. If this doesn't sound like a fun day trip then I don't know what does! We started the morning with donuts from Durham's very own Rise Biscuit & Donuts, a breakfast shop featuring local ingredients. I try to introduce guests to this wonderful little shop. Rise is very popular... so popular I went to get donuts Friday afternoon otherwise we would've had a long wait at the store. And I knew we had things to do in Saxapahaw Saturday! 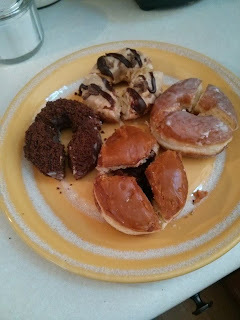 We polished off our donuts with coffee and baked apple oatmeal (to be featured on the blog soon). First up in Saxapahaw was the Third Annual Saxapahaw Antiques Festival at Roxy Farms Antique aka browsing things in a field. We enjoyed seeing the various items for sale. Then we went across the Haw River to the restored Rivermill Village and had a tasty lunch at The Eddy Pub. The Eddy Pub has great expansive views of the river. 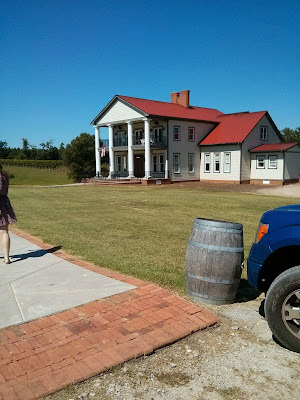 After lunch we crossed back over the Haw River to Benjamin Vineyards & Winery. Here we had a wine tasting and relaxed under their porch with rocking chairs and a view of the vineyards. Their specialty is sweet muscadine wines but they do produce dry whites and reds. You guessed it, we went back over the river one more time to hear live bluegrass music at the Haw River Ballroom for the Saxapahaw Oktoberfest celebration. The music was bluegrass-y as promised but as the sun set it became very cold and we weren't adequately prepared for the elements so we came home. 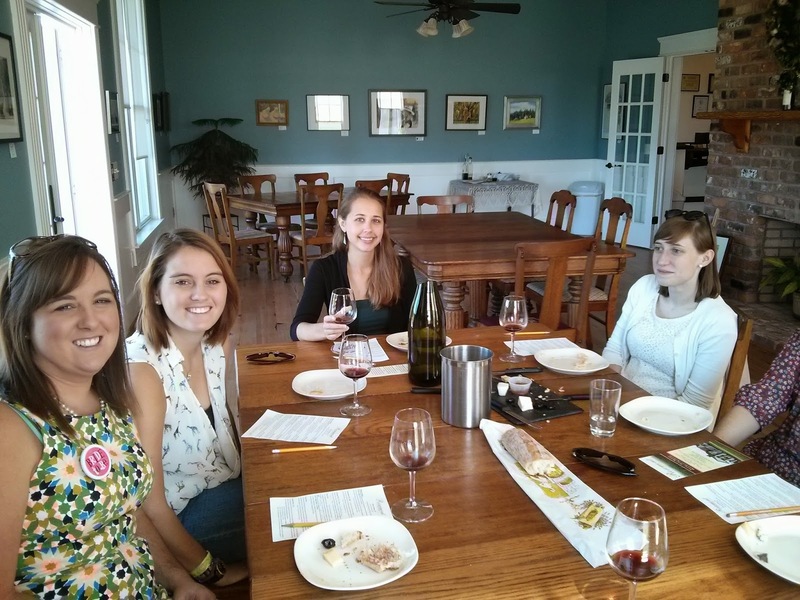 The NY Times even recommends you visit Saxapahaw; read their Travel article here. On Sunday, per request of Marie, we headed over to the NC State Fair in Raleigh. Before we went to the fair we had brunch at 518 West Italian Cafe in Raleigh. Since we had a filling brunch we wouldn't be tempted with all of the fried fair food. At the fair we enjoyed the Heritage Circle and the Flower & Garden Show among other exhibits. For dinner we came home and had a relaxing evening together. Soup and sandwiches are the perfect fall dinner. Patrick and I served Quick Italian Beef & Vegetable Soup with grilled cheese sandwiches. 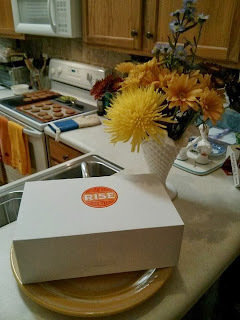 Pumpkin ice cream and molasses cookies (featured on the blog Wednesday) were the perfect dessert! 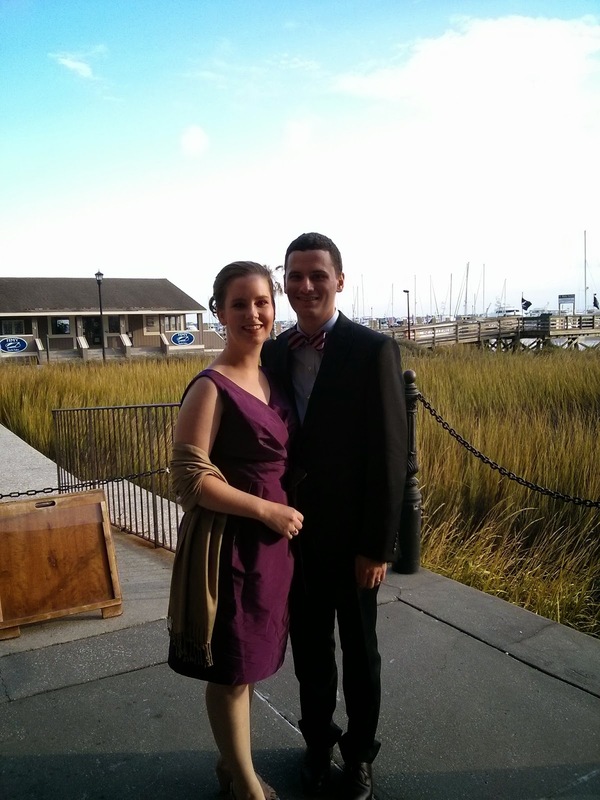 Marie has been visiting Patrick every fall since freshmen year when Duke hosted Parent's Weekend. I'm glad she's continuing the tradition even after he's married! 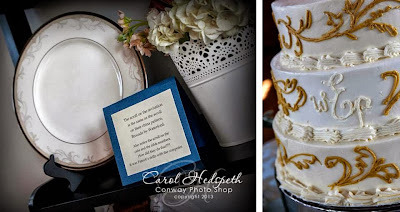 Now that we're back to blogging, along with lots of recipes and fun things-we're-doing posts, you may have noticed some "Registry 101" and "Wedding throwback" posts. We hope you're enjoying a look back at more of our personal lives during our sixteenth month engagement and how we planned our wedding. There's lots more to come! Registry 101 posts detail our experiences with registering; there are some pros and cons for various products and how/why we selected what we registered for. We've already posted about our fine china and casual china! Cookware, kitchen electrics, and cutlery will soon be featured in this wedding section. 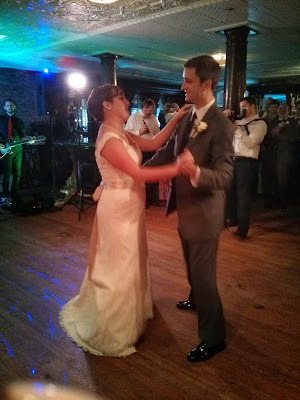 Wedding throwback posts are more directly about the planning process and exactly how our wedding came to be the way it did. The first post in this section was about addressing wedding related things. 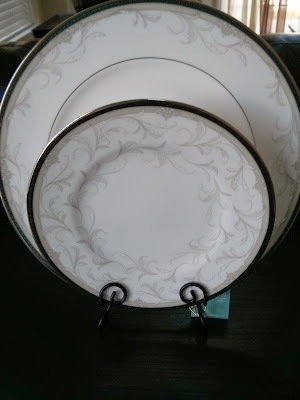 And this post today is about how our china pattern inspired our wedding! If someone asked Patrick how we came to have our china pattern as the theme of our wedding he would say "Whitney got this crazy idea in her head" which is probably not too far from the truth. I can't say this was a Pinterest idea or something I saw in a wedding magazine because at some point I knew we were trailblazing in the wedding industry! We got some funny looks when explaining we were using our china pattern as the inspiration for our wedding. So the idea either came to me in a dream... or staring longingly at my china pattern at work and how excited I was that Patrick and I had finally chosen a pattern! The more I studied the pattern the more I noticed the border of the pattern. There's a slim Greek key pattern on the outermost edge in a black band followed by a taupe band and then a wide border featuring a raised leaf design that dances around the rim. 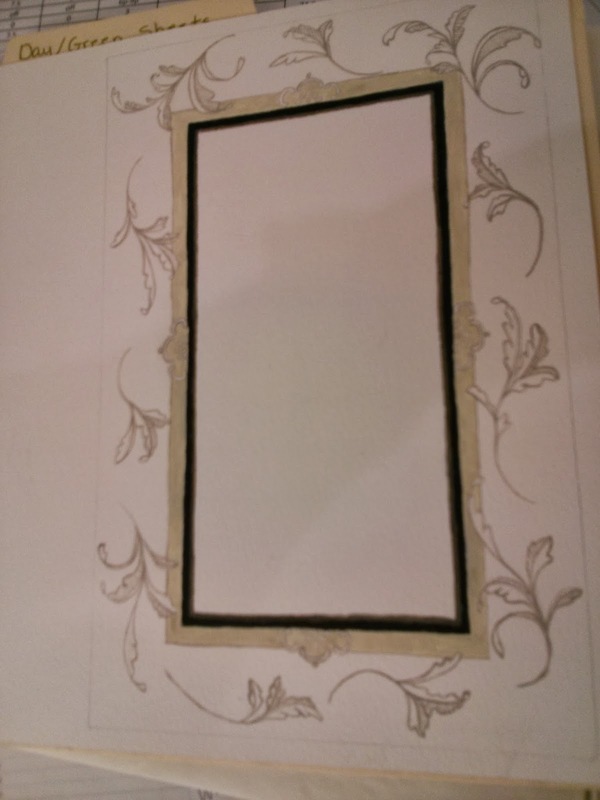 My idea was to inverse the pattern and have the black Greek key pattern outline an inch border around an invitation and then have the scrolling raised leaf design go around the outside edge of the invitation. One of my colleagues at the bridal desk just so happens to be an artist who specializes with pastels and does amazing work as made obvious by this Brocade rendition as a wedding invitation mat. Rebecca Margolese-Malin is a local artist and has lots of experience with portraits and still lifes. See more of her work here. I loved what she had done! My vision was to take this to Papyrus (we were working with a representative there who partners with various invitation companies and we chose William Arthur) and have this submitted as "artwork" to have printed with text inside the border. I was a little heartbroken when I learned that if we wanted to submit our own "artwork" it must be in vector format (aka a computer file). So then I turned to my husband-to-be who knew all about vector formats. Patrick really threw himself into the designing invitation task and they came out wonderfully! He listened to my ideas and used Rebecca's Brocade border mat as a jumping off point to create a more relaxed yet classic invitation. We agreed that the scroll all the way around the border and centered text would give the invitation a more formal look and Patrick thought it was too busy. 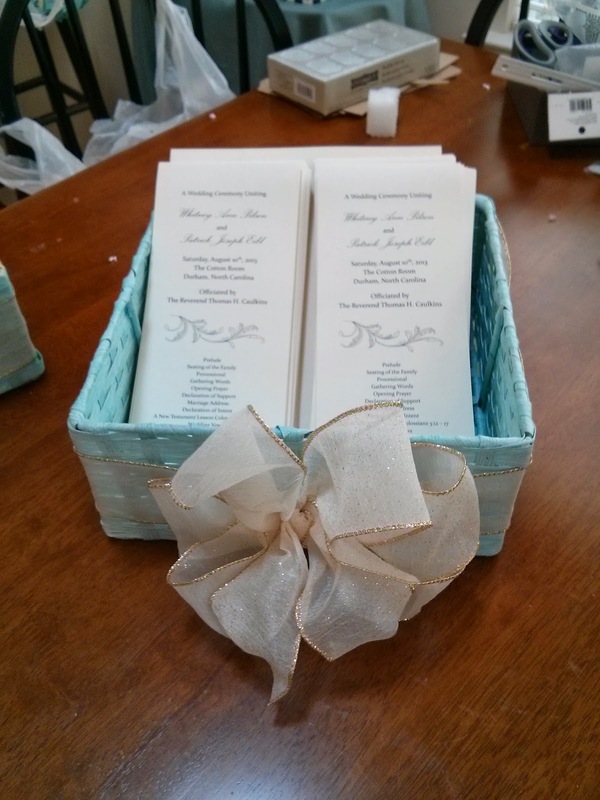 An invitation lets your guests know what to expect for the wedding. Since we were getting married at eleven thirty in the morning we envisioned a simple, relaxed, and still classy reception. With that in mind Patrick removed the borders and simplified the artwork to feature just three scrolls. He then broke up the text, used different alignments and justifications, and created invitation wording that flowed down the paper. I would describe the end result as more organic and represented something more simple and relaxed yet still classy. We had these ordered in March and then everything else for the reception fell into place when I had another crazy idea! Not only could the Brocade pattern be featured on the invitation but I could put it everywhere!!! Well not really; I wasn't sure how much we could use the scroll pattern but as we came to making decisions I realized we could utilize the scroll pattern in more places than I originally thought we could. 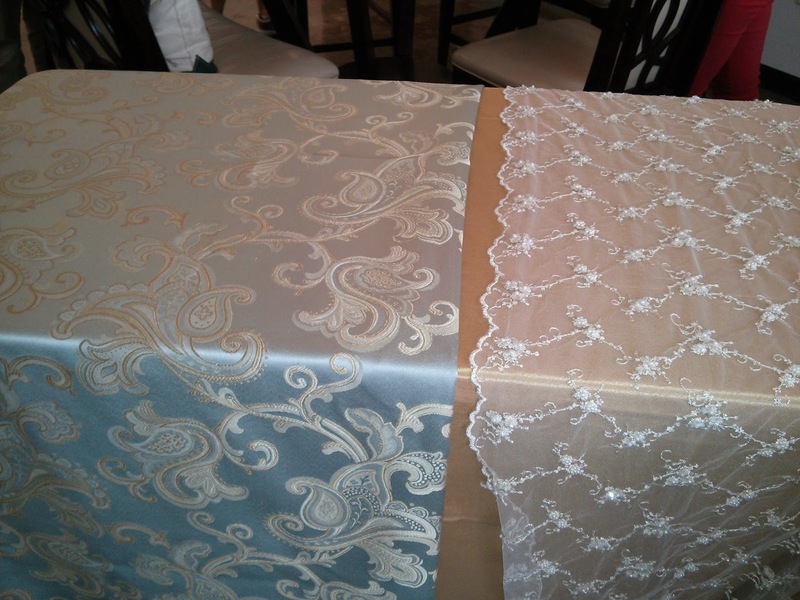 Basically, instead of "wedding colors", I had a theme and that was the Brocade scroll pattern. I did pick up the taupe/champagne of the pattern and incorporate it into "colors". Patrick and I didn't want to be defined by what colors we could and couldn't use. By selecting champagne as a focal point we were able to create a neutral palette and have a soft ambiance. The wedding industry will make you have colors though; everyone always ask what they are! So I made blue the other color just to satisfy those folks who must know what my two colors are. After the invitations were finalized the next thing I realized we could put the scroll on was the cake! How perfect would it be to have our baker pipe champagne colored buttercream frosting onto the tiers of the cake. 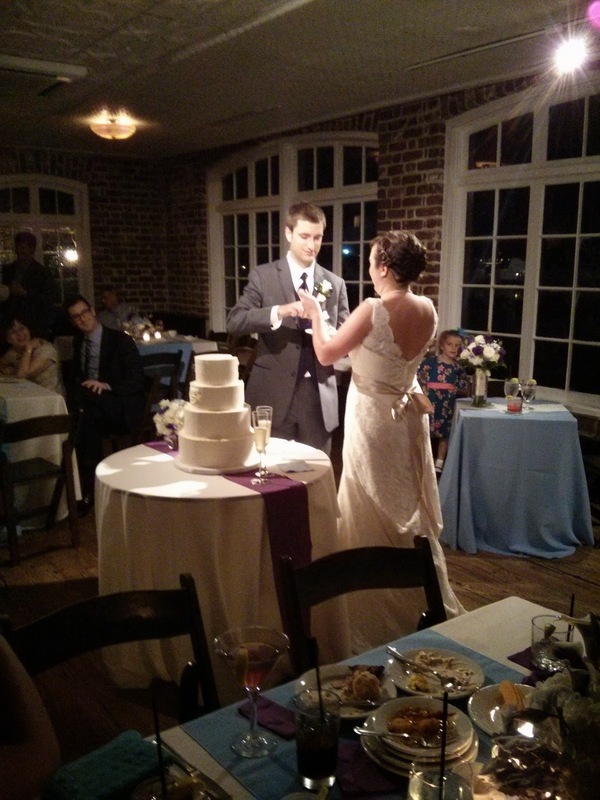 If you're in Durham, we highly recommend Daisy Cakes for your bakery needs! 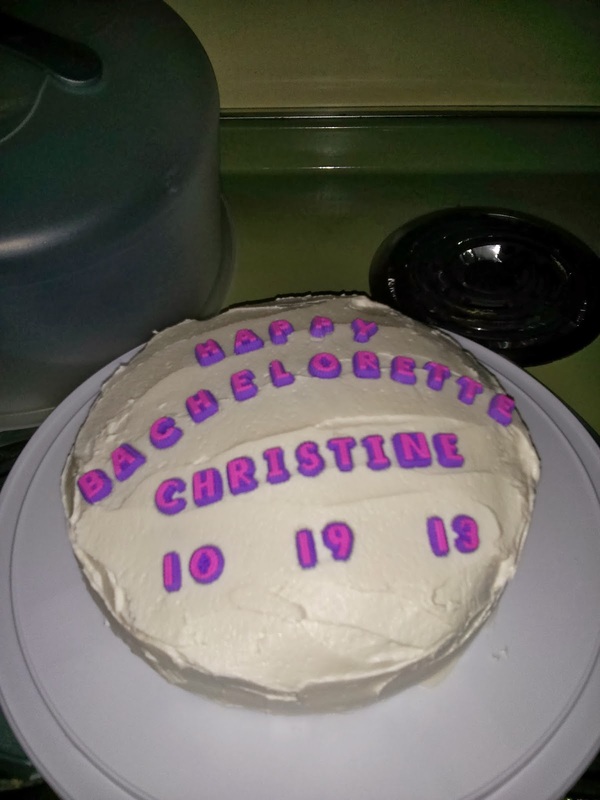 Much like I didn't want to fuss with determining colors, I didn't want to fuss with a cake topper. Our baker then piped our monogram onto the center of the cake and then I didn't need a cake topper! 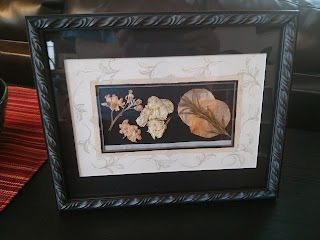 Carol put this montage photo feature up yesterday. 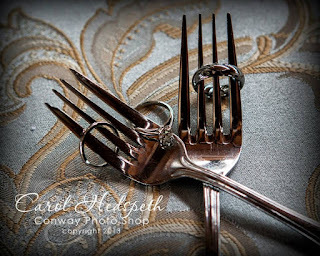 If you're in northeastern NC, we highly recommend Carol Hedspeth of Conway Photo Shop for your photography needs! My mom also really got into the whole Brocade theme and wanted to make sure we displayed a Brocade china plate as well as the invitation at the reception. One of her crazy ideas was to use a Brocade tea cup as a cake topper but I said that was too crazy! ...and now you see where I get crazy ideas. The sign next to the plate reads: "The scroll on the invitation is the same as the scroll on their china pattern, Brocade by Waterford. Also notice the scroll on the cake and the table numbers. How did they do that?!?! It was Patrick's skills with the computer." As you see Mom mentioned in the sign, the scroll was featured on the table numbers. I had Patrick create a single scroll image and place it on 4x6 cards with numbers above it. 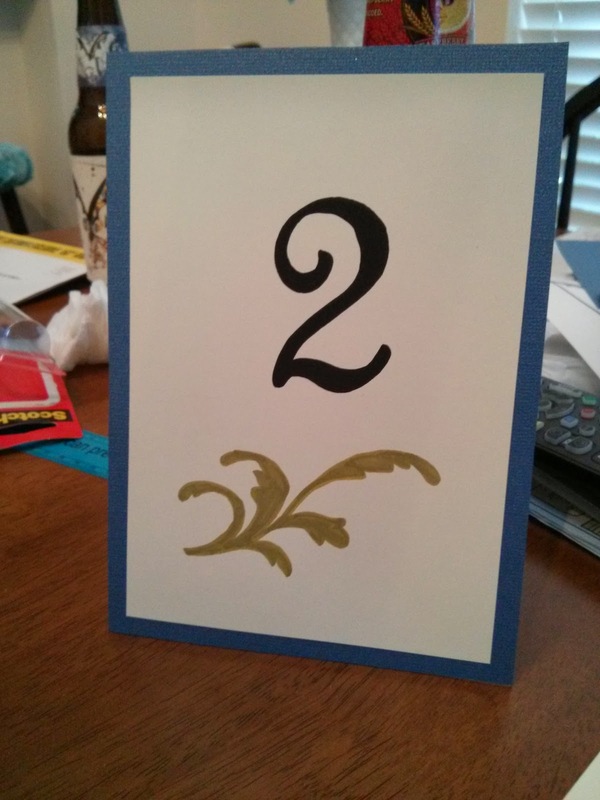 Both the number and scroll were printed onto 4x6 cardstock with dotted outlines. Then we colored in with a black marker for the numbers and a champagne marker for the scroll. Since my other "color" was blue we backed them in blue. Next up was linens! Patrick and I had a few very large books of material swatches to go through at our venue. 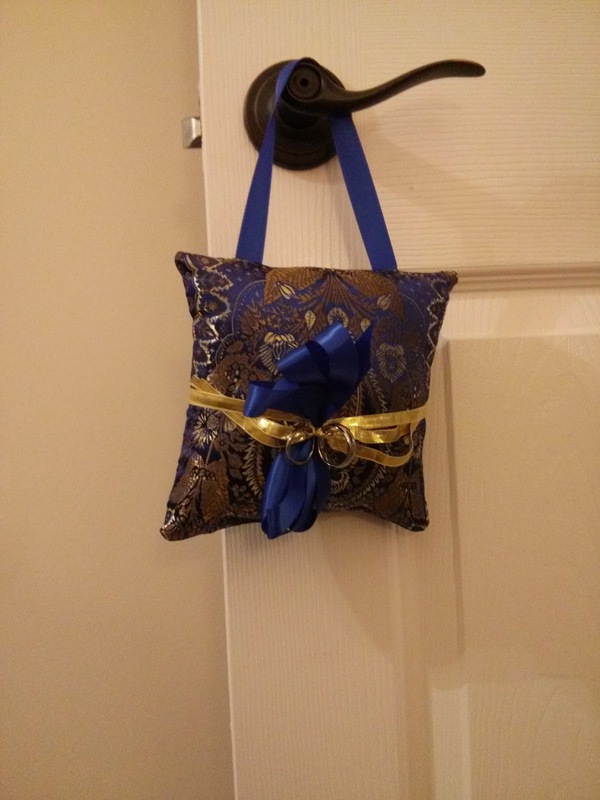 We fell in love with a blue and gold damask pattern that complemented the Brocade scroll pattern. However, before we decided on this, I knew that after making this decision the Brocade scroll would be our focal point of the reception. If we wanted to forego the scroll as a thematic element then we would be able to do a plain gold linen and have more pops of color in the floral selections otherwise the linens and flowers would be competing for our guestss attention. After some deliberation Patrick and I both decided that we liked the blue-gold damask linen and would go with neutral flowers so that the Brocade scroll could be the star of the wedding! 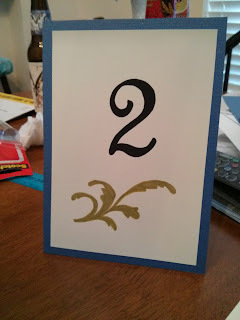 We selected the blue-gold damask for the dining tables (half the dining tables would be gold to contrast) and then a sparkly off white overlay for cocktail tables. This is after all my wedding; I needed some glittering sparkle somewhere! The linens coordinated with the theme flawlessly. 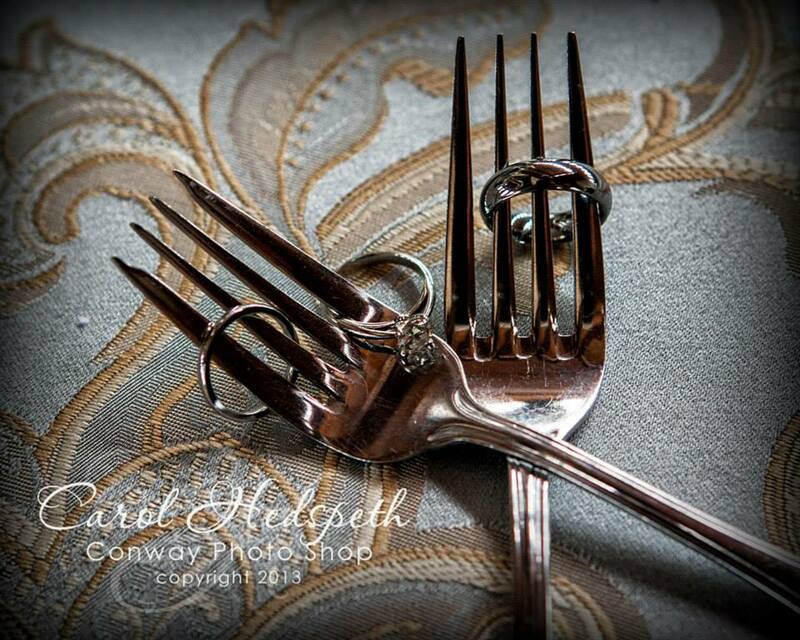 ﻿Carol used the blue damask linen as a backdrop for taking a feature picture with our wedding rings. 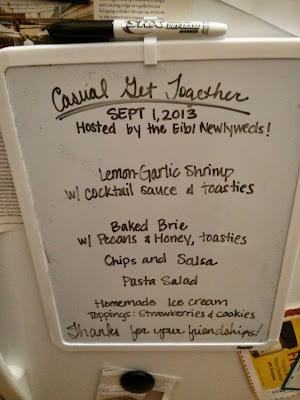 She even used forks since we love trying new recipes and have a food blog! How cool! At some point Patrick decided we should make the ring bearer pillow. And by "we" he meant his wife-to-be. Off I went to JoAnn's to find a suitable material and guess what I found! Can you read the label? It's a Brocades/Jacquards material! 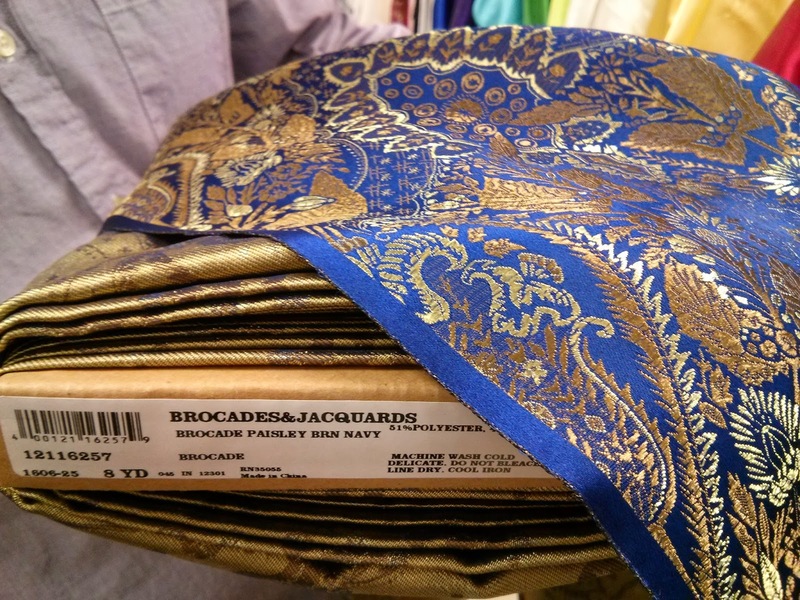 I found a gold and blue damask style Brocade fabric!! The blue was a bit brighter than I would've liked but I was sold! My excitement lasted until I realized I now had to make the pillow. But we made it and tied some rings on for the ceremony. And the final Brocade scroll spotting would have been on the ceremony program! 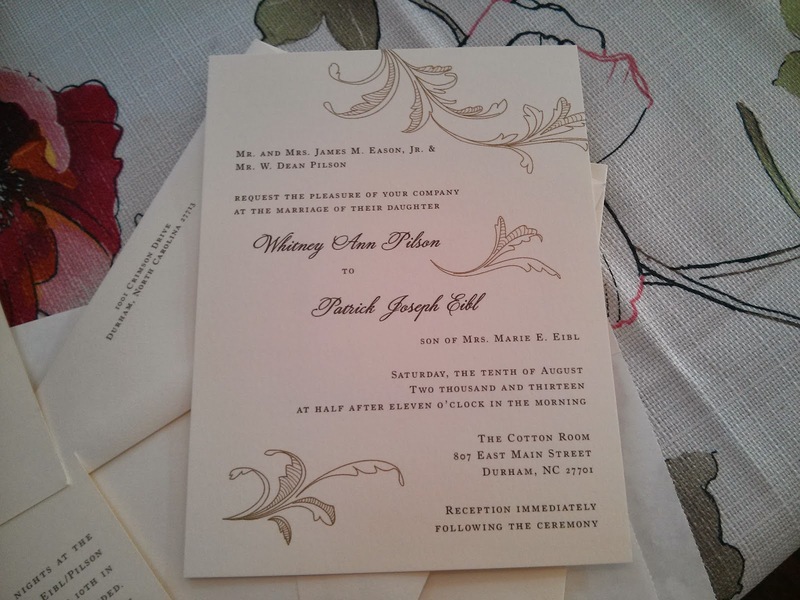 Patrick designed these with one of the images he had used in the invitation. The scroll is the middle of the program; sorry for my bad quality phone picture here. And that's all the Brocade folks! I know this looks like a lot of Brocade but I think it was subtle. In conclusion, I'd like to encourage future brides to select a theme rather than colors. Just find something cohesive tying your wedding together. I attribute my following-theme skills to all my time in our high school yearbook elective! But don't worry if you weren't the yearbook editor; it's not too hard to figure out how to tie a unifying element together and create something flawless. And as a bonus for us, instead of colors to remember our wedding by, we have our Brocade theme. Every time we use our fine china we can think fondly of that special day we became Mr. & Mrs. I am committed to using our china (we've used it three times already; read about the first time here) and know that the older we get, the more we will cherish the china and the day we started our marriage. Now, did you wonder what happened to Rebecca's mat? 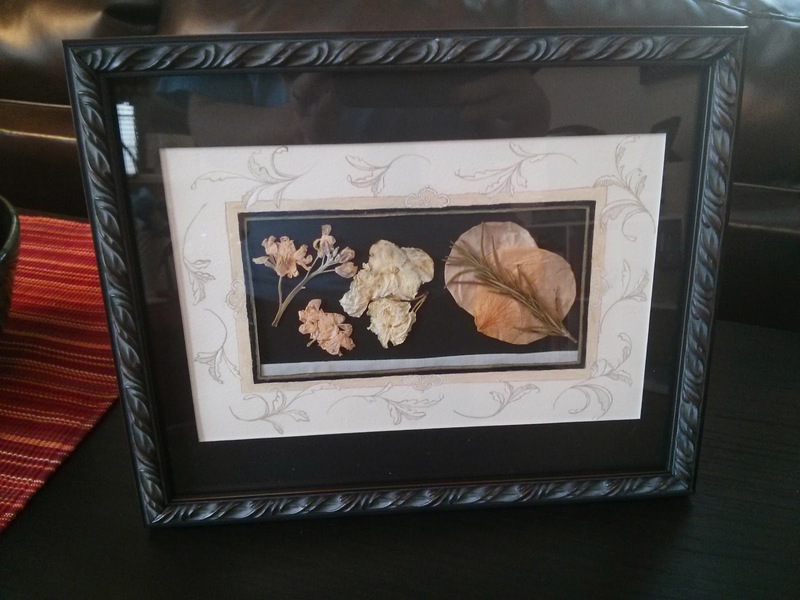 She graciously framed it and gave it to us as a wedding gift! What a keepsake it is! I made it even more keepsake-y. I dried flowers from my bouquet and arranged them inside the mat. The flowers on the left are from my bouquet. The two overlapping rose petals on the right are formed by a petal from my bouquet and a petal from Patrick's boutonniere. I had asked the florist to include a small twig of the rosemary herb in Patrick's boutonniere to represent our time together in the kitchen. I then placed the dried rosemary twig over the two rose petals. Maybe we like our china pattern a bit too much?! Do you have dishes you love love love too?? When I think of traditionally prepared southern greens, I think of a dense, dark-green, mushy blob of leaves tasting of strong bitterness and maybe a hint of butter. Until someone convinces me otherwise, Whitney and I have to come up with other ways to use the greens from the CSA that it seems have been arbitrarily labeled as food and make them tolerable to eat. Kale is one such green, which in the past Whitney has chopped up and passed off as lettuce in our salads, with mild success (a vinaigrette can mask the bitterness, and the extra chewing gives my jaw a good workout). This particular time I requested we try making kale chips, which were on my mind after there was some nice crispy kale on top of a risotto dish I had recently enjoyed at Piedmont, a downtown Durham restaurant that specializes in local farm-to-table fare. Whitney followed this recipe from marthastewart.com. I think they turned out great! This is my new favorite way to eat kale. I look forward to experimenting with more interesting ways to season them. This time Whitney mixed in some garlic-infused olive oil, which added some nice flavor. Tear the leaves of one bunch of curly- of flat-leaf kale into 2-inch pieces and toss with a tablespoon (or two, depending on how healthy you're trying to be) of extra-virgin olive oil and a teaspoon of coarse salt. Spread the kale out on a large rimmed baking sheet (use two baking sheets, if necessary -- the kale should have enough room to bake in a single layer). For dry, crisp chips: Bake at 300 degrees for 30-35 minutes, stirring halfway through. For toasted chips with browned edges: Bake at 350 degrees for 12 to 15 minutes, stirring two or three times. The chilly weather over the last few weeks and this particular cold front with arctic air means fall is here! We had two pie pumpkins from our CSA and I decided to roast them for pumpkin puree. 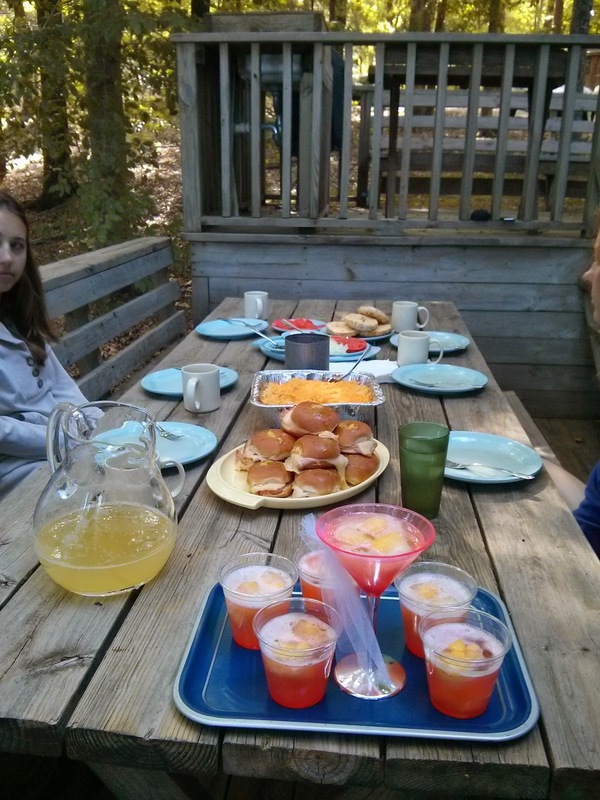 The two pumpkins produced 5 1-cup portions of puree. I saved one for this recipe: pumpkin ice cream! Pumpkin recipes also mean fall is here! Here's the pumpkin getting pureed! 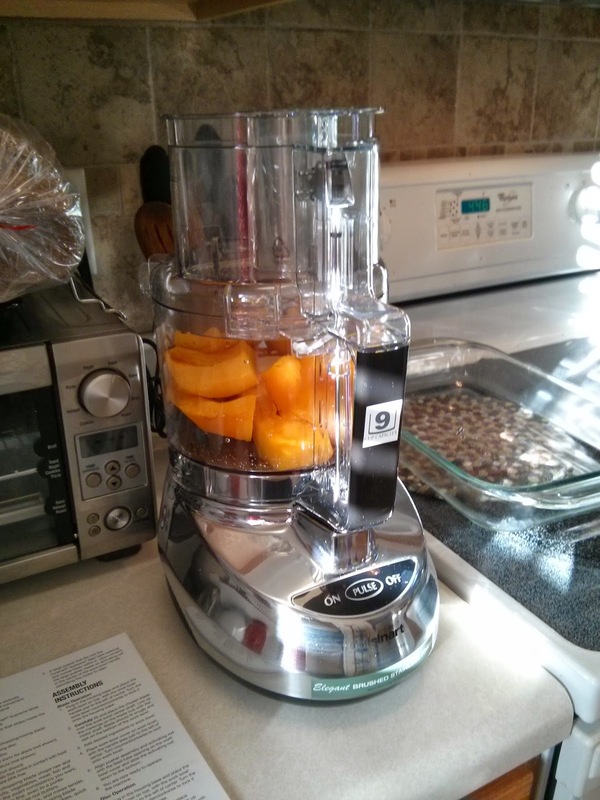 Check out our shiny new food processor. Read more about how we picked it out and other kitchen electrics at the end of the week! More tales from the CSA! The suspect this time is eggplant! Much like sweet potatoes we tend to select eggplants off our list multiple times throughout the season. Our absolute favorite eggplant dish is Rachael Ray's Eggplant Parmesan; first made and introduced on the blog in 2010. That's right folks, we've been making this recipe for quite awhile now and have really perfected it! My favorite part of the recipe is the lemon zest in the breading; really takes things up a notch! But we can't keep having fried eggplant. And a couple weeks before we tried this ratatouille recipe I made a roasted eggplant dish with quinoa (check back later for that) so I knew we needed to find something new for the eggplant. And then I thought making ratatouille would be a good idea. Everyone loves that Disney movie, right?! After thinking about the movie, admittedly maybe a little too much, I realized that I had never had the featured dish: ratatouille! It was a stroke of genius because I had everything in the kitchen waiting for me: eggplant, squash, onions, garlic, tomatoes, and pepper! I found a recipe on Food Network.com from Anne Burrell and put it on the weekly meal plan. Coat a large wide pan with olive oil. Add the onions, season with salt and crushed red pepper and bring the pan to a medium heat. Cook the onions until they are soft and very aromatic but have no color, 7 to 8 minutes. Add the garlic and cook for 2 to 3 minutes. Add the tomatoes, 1/2 cup water, thyme bundle and season with salt. Cook the tomatoes until they become very pulpy and have broken apart, 15 to 20 minutes. Add the peppers and cook for 5 minutes. Add the eggplant, summer squash and zucchini, season with salt and cook until the squash is soft, 15 to 20 minutes. Stir in the basil and taste to make sure the seasoning is correct. Serve warm or at room temperature. Just a few notes: I did not use fresh thyme or basil. Our fresh herbs did not survive into the fall; I substituted dried herbs instead. I substituted chicken stock for the 1/2 cup water added to the tomatoes. I did not have zucchini so used an extra squash! We served the ratatouille with a bit of shredded cheese on top in our Denby Halo rimmed soup bowls. Remember how I said we loved a rimmed soup/pasta bowl?! They're so versatile. I also wanted to highlight the glaze variations in the pattern. Denby hand glazes each piece which means no one bowl is the same. Through working at Macy's I had previously reached out to Denby because a couple was concerned about some differing color hues in their pattern. I learned that Denby has a controlled pattern with approved variations above and below that. Below is an example of some variations in our pattern. I think these two must be extremes of what is approved! After we returned from the honeymoon we decided we wanted to have a party! Or a "casual get together"! The main reason we wanted to host this casual get together was because we felt like we didn't get to see a whole lot of our friends at the wedding. We didn't anticipate that the bride and groom would be so busy doing all the wedding things throughout the whole reception! In addition to our menu, our guests also brought contributions! 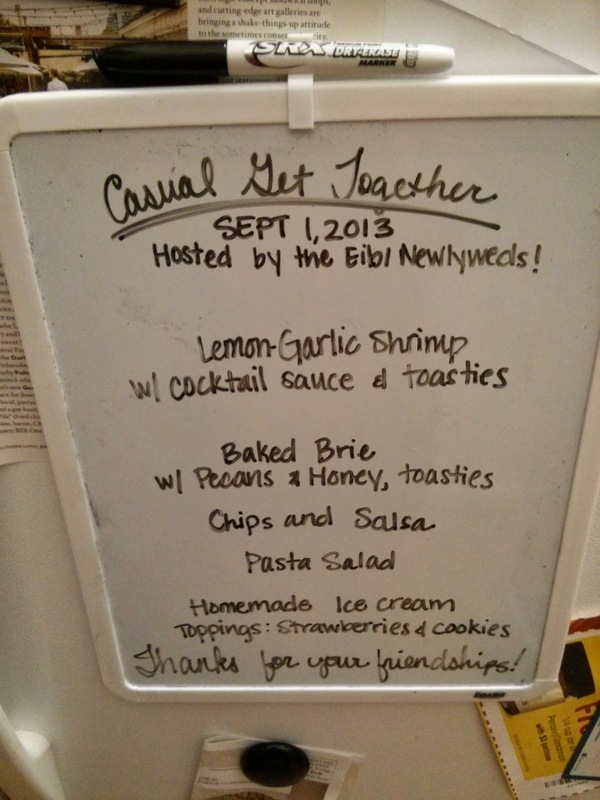 I followed a Pioneer Woman recipe for the Lemon-Garlic Shrimp which was a savory appetizer for the party. Then, for the first time ever, we made homemade ice cream with our new freeze bowl attachment for our mixer! We followed the recipe in the manual. One thing I would have done differently is to freeze it a few hours prior to serving; as we did it, we pretty much served it right out of the freeze bowl and it turned very soft in no time. It was delicious though! Homemade vanilla ice cream served with strawberries and crushed oreos. In medium saucepan over medium heat, heat half-and-half until very hot but not boiling, stirring often. Remove from heat; set aside. Place egg yolks and sugar in mixer bowl. Attach bowl and wire whip to mixer. Turn to Speed 2 and mix about 30 seconds, or until well blended and slightly thickened. Continuing on Speed 2, very gradually add half-and-half; mix until blended. Return half-and-half mixture to medium saucepan; cook over medium heat until small bubbles form around edge and mixture is steamy, stirring constantly. Do not boil. Transfer half-and-half mixture into large bowl; stir in whipping cream, vanilla, and salt. Cover and chill thoroughly, at least 8 hours. Assemble and engage freeze bowl, dasher, and drive-body interface as directed in attachment instructions. Turn to STIR Speed (Speed 1). Using a container with a spout, pour mixture into freeze bowl. Continue on STIR (Speed 1) for 15 to 20 minutes or until desired consistency. Immediately transfer ice cream into serving dishes, or freeze in an airtight container.